Tabbed browsing has changed the way we surf the web, making it ridiculously easy to load sites in the background and switch between a bunch of pages in seconds. Now, you can get the same interface for browsing through your files on Windows. Here’s the tool you’re going to need and how to use it. It’s called Clover, it’s free to download and use, and it works on every version of Windows since XP. 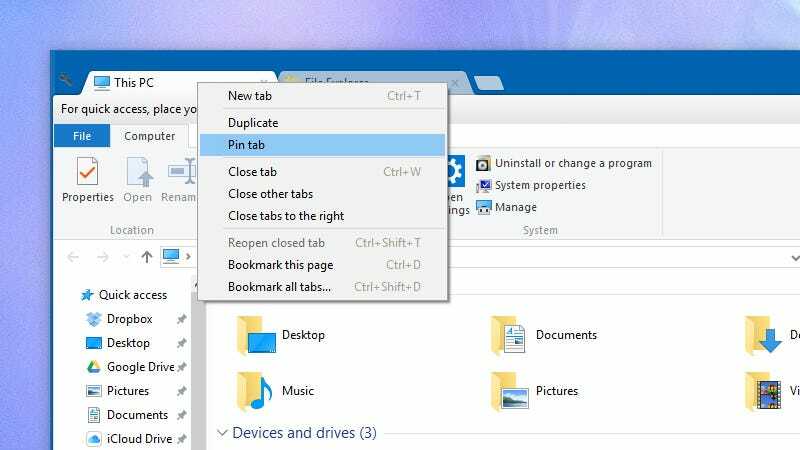 Once you’ve got it up and running—and it does take a couple of minutes to initialize—your File Explorer windows come with the tabbed headings that you’ll recognize from Chrome, Firefox, et al. Right-click on a tab heading to open a new tab or pin a tab, just like in your browser, or use the keyboard shortcuts shown on the menu to navigate around even more efficiently. If you use the mouse wheel while hovering over the tab bar you can quickly switch between all the folders you currently have open. The wrench icon to the left gives you access to Clover’s settings, where the program lets you turn various features on or off, including one to remember previously opened folders on startup. There’s also a bookmarks bar where you can peg folders and drives you frequently need access to. To go back to the original File Explorer interface, simply uninstall Clover from your system.